Ask anybody if they have ever heard of Prime Minister Chen’s Castle and you’ll probably get a shrug of the shoulders and a look of ‘what are you on about?’ However, in China, this is a so-called five star tourist attraction, receiving thousands of visitors everyday day and with a hefty entry ticket of 120 yuan. 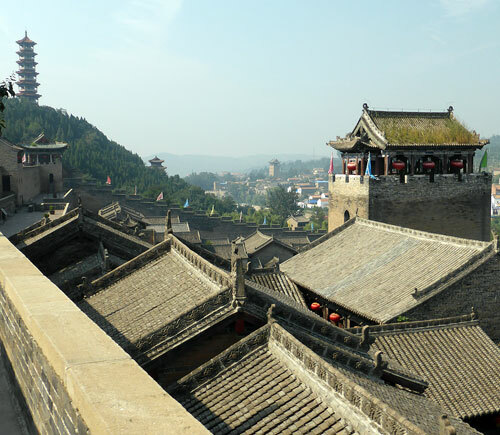 It is also an amazing example of ancient Chinese fortress architecture and is absolutely stunning. If you plan your visit well, it is easy to avoid the crowds and have the place to yourself for an hour or so. 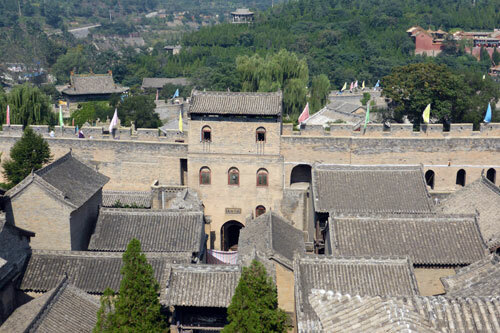 More than a castle, Huangcheng Xiangfu is more like a fortified village. 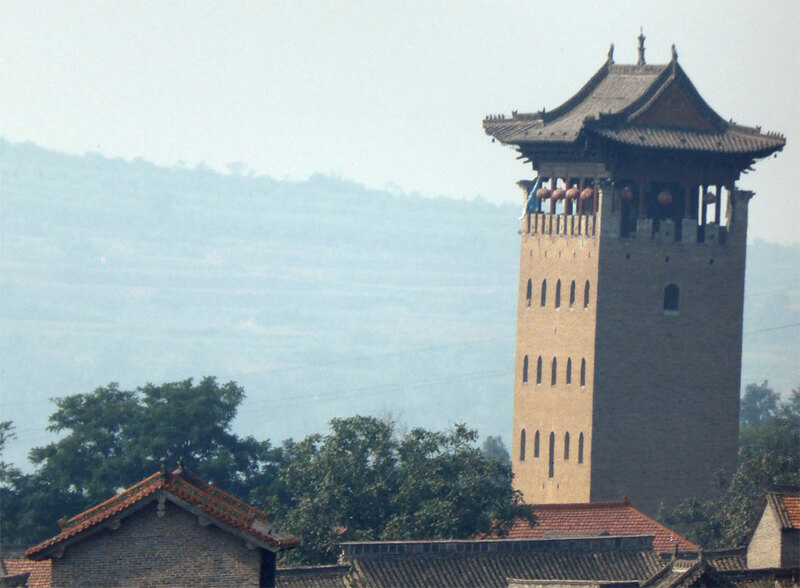 It was built in the 17th century and its primary purpose was to protect the Chen family and the villagers from rebelling peasants and bandits. Minister Chen (Chen Tingting), who was prime minister under the emperor Kangxi, is famous for being the co-author of China’s most famous dictionary. The dictionary, the biggest Chinese dictionary until 1993, included 49,0303 characters. It was called the Kangxi Dictionary after the emperor. There are volumes of the dictionary on display in the Castle. 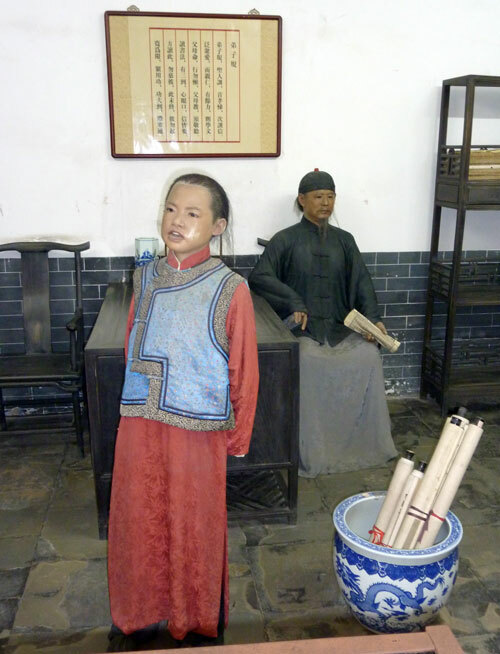 Chen Tingting died before the dictionary was completed in 1719. Arrive exactly at opening time. When the castle opens, the Chinese tour groups (there were a lot of them) are treated to a 45 minute song and dance performance by locals dressed up in Chinese imperial costumes. If you skip the performance, you get the castle to yourself during this time, and even longer if you have reached the battlements. It is quite an experience having the whole place to yourself. Entering the castle through the main gate definitely feels like stepping back in time. 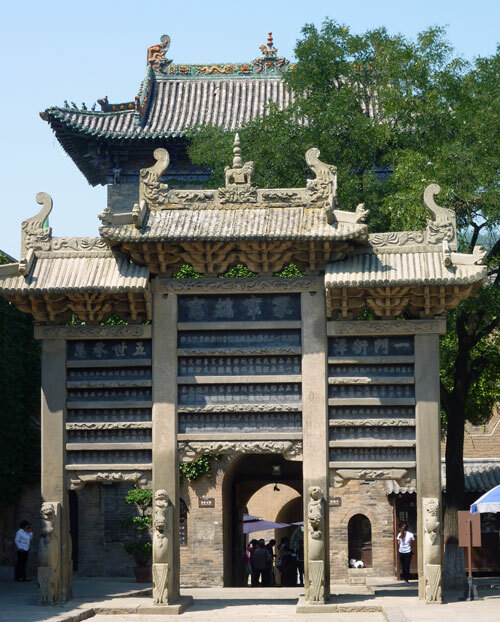 We walk through several courtyards, where the wooden pillars are held up by carved stone bases, some of which depict lions going between the legs of a table. 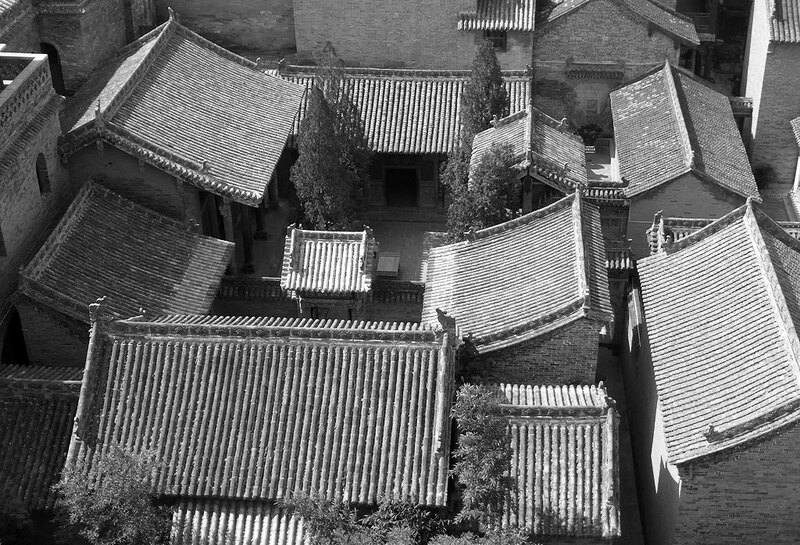 Inside the courtyard rooms, there are pieces of wooden furniture, inlaid screens, scrolls, large vases and so on; all the familiar trappings of Chinese interior decoration. 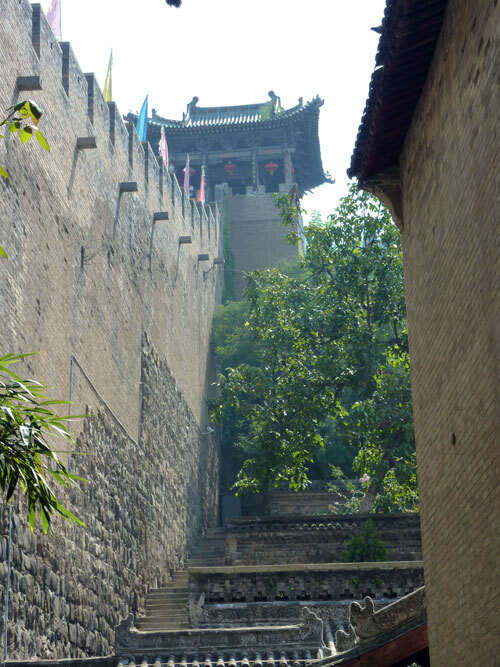 After passing through the courtyards, we begin the climb up various flights of stairs to the different levels of the castle, eventually coming out on the crenellated battlements with their colorful banners fluttering in the wind, just as they must have done in the past. 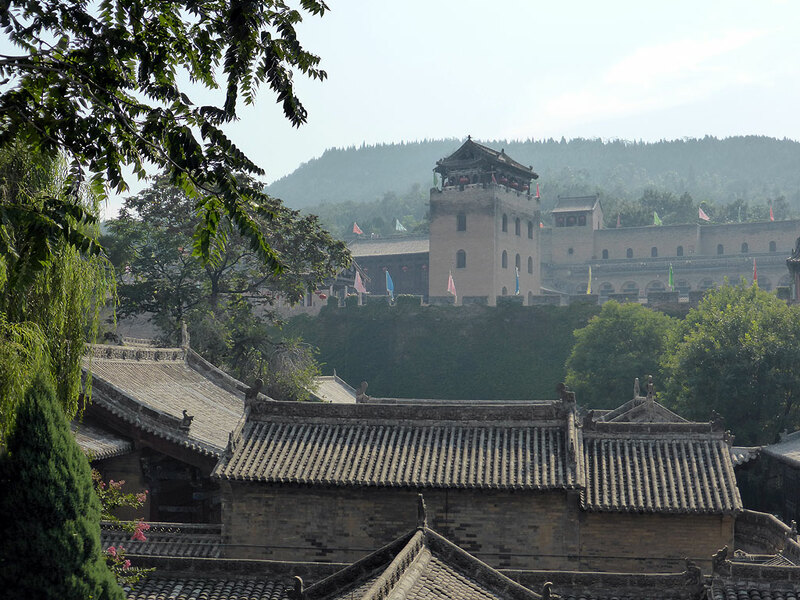 One of the highlights of the castle is the amazing watchtower, which has great views over the maze of courtyards, passageways and battlements, and on towards the ancient village of Guoyu 郭峪古城. 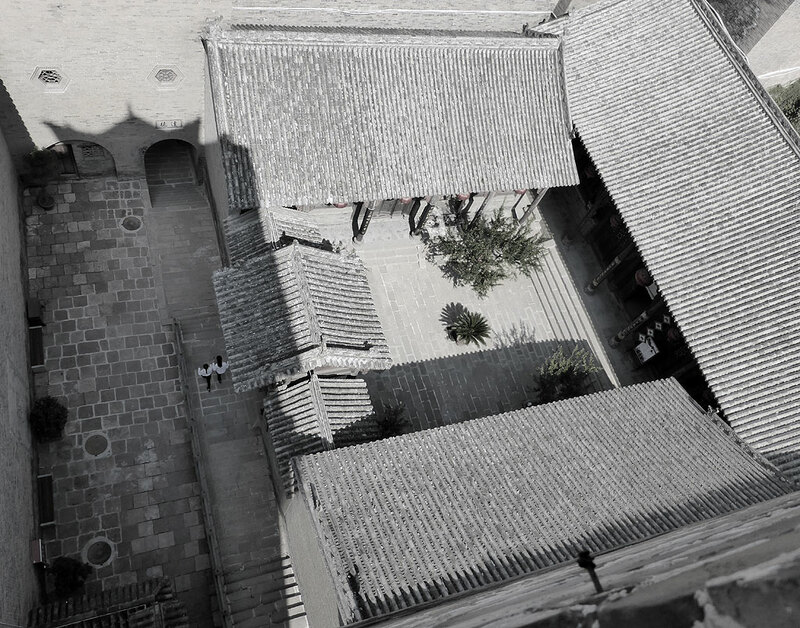 In one courtyard, there are enormous, traditional, brown ceramic wine vats and a wooden stall selling their contents. It’s something the site does quite well: managing to blend history and conservation with commercialization and entertainment. Apart from the aforementioned song and dance show, there are also regular performances of musicians, dressed in costumes of course, playing traditional instruments. 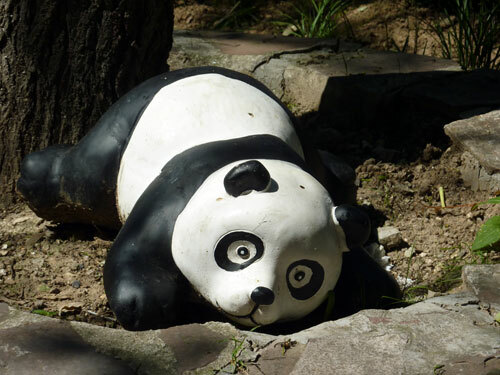 However, one addition that struck us as particularly tacky was the collection of incongruous little panda figures, strewn all over the castle and gardens. They are quite cute and photogenic though. And a big hit with visiting kids! Continuing our ramble through the castle, we go through a set of gorgeous brick gates, guarded by lions, visit the clan temple, follow a wall by a stream, go down a painted, covered walkway, like the one in the Temple of heaven, look into some class rooms where the Chen family’s kids used to study and so on. Some rooms have been reconstructed to show what life was like back in the 17th and 18th centuries, using rather authentic looking models. Further along, on our way back towards the exit, we wander through some idyllic gardens, complete with streams, rockeries, bamboo groves and, of course, more frolicking pandas. After two and a half very satisfying hours, we emerge right by the monumental triple entry gate and take our leave of the castle. 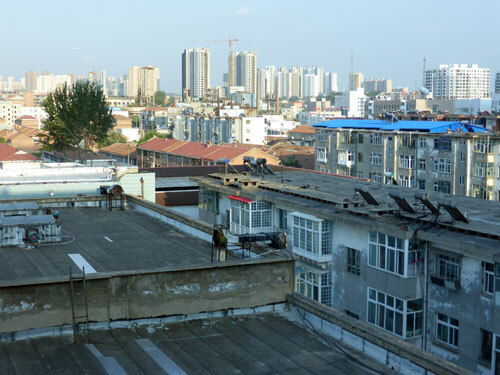 We stayed in Jincheng in the Sunshine hotel (Yangguang dajiudian 阳光大酒店) on Zezhou Lu 泽州路, the main street in town. The room cost 200 yuan with a great eclectic breakfast included. There was wine, beer and rice wine, as well as coffee and soy milk, but no fruit juice. Their restaurant serves pretty decent food in the evening too. There were hotels near the Castle as well. To get to Prime Minister Chen’s Castle we hired a taxi for the day. 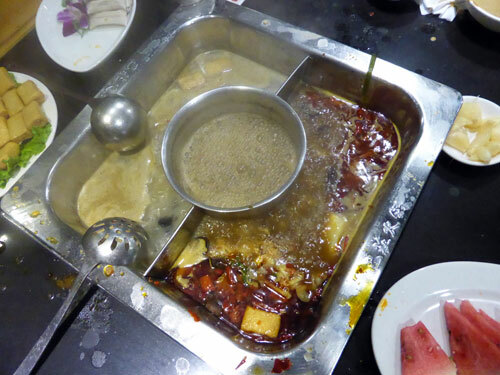 The driver charged us 400 yuan, to take us there and on to various other sights. 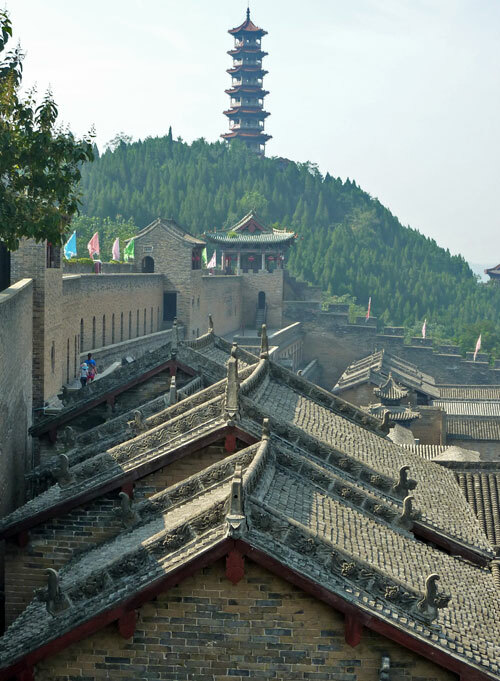 You can also get to the castle by taking a local bus from the east bus station in Jincheng.